Why use Wicker Baskets for Wellies? Wicker baskets are great for storing rubber boots. Rubber is a natural material obtained from the rubber tree. Rubber is best kept in a dark airated box - wicker baskets are perfect and they're made from natural material just like the rubber wellies. 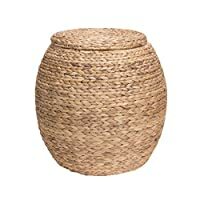 Hand-woven from natural rattan with a lift-off lid and cotton liner, this elegant basket makes for practical storage in the living room, bedroom or nursery. Handcrafted by artisans in Indonesia. Made of natural rattan. Hand-dyed, so colors will vary and may be a different shade than the image displayed. Baskets are handmade, therefore sizes may vary. 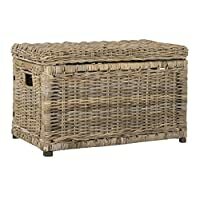 Hand-woven natural rattan over a sturdy wooden frame, this elegant wicker trunk is perfect as extra storage in the bedroom or as a table in the living room. 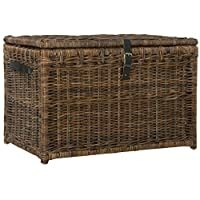 Hand-woven natural rattan over a sturdy wooden frame, this elegant small wicker trunk is perfect as extra storage in the bedroom or nursery. Hand-woven natural rattan over a sturdy wooden frame, this basket is perfect for storing linens or clothes and almost too pretty to hide beneath your bed. ~Color White Wash. Natural color of rattan has a beige tint. We paint rattan in white, polish it - and only after this process we can achieve a White Wash color. Approx. 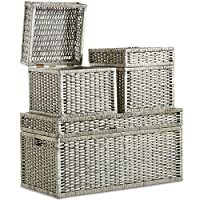 Dimension: 15.8.7" x 11.5" x 5"
Small: 20"H x 16"W x 17"D.
Medium: 23"H x 18"W x 19"D.
Large: 27.5"H x 20.5"W x 23"D.
Wicker Basket Can be used for sorting laundry, toys orbits around home. Can Store some cosmetics, small things. A nice pastoral style decorations. AS a featured suitcase, picnic box. Can be placed anywhere, any kind of thing can be stored in these flexible baskets. There are no restrictions on the conditions used.